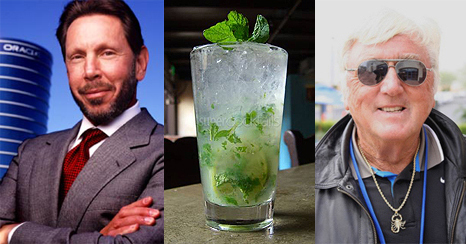 Big news: Larry Ellison, Mojitos, Robert Lansdorp - not necessarily in that order. But this year the news is bigger than ever, because in January one person bought the whole tournament - that's right bought Indian Wells, 100%. That person is Larry Ellison. America's Cup in February, Indian Wells in March. In case you don't know who Larry Ellison is, his real business is a company called Oracle, which, I have been told, is the world's largest software company. Oracle is to business software what Microsoft is to your personal computer, except Oracle products tend to actually work. If you follow sailing, he's the same guy who has been trying for years to win the America's Cup. And just this February, he finally did it, in Spain, sailing probably the most hi-tech racing boat ever created, a tri-maran with a 220 high wing for a main sail, a boat that could travel at three times the speed of the wind. Now that is intense. But first back to the sale. Ellison bought out everyone: Charlie Pasarell, Ray Moore, the two founders, plus the group that saved the tournament from China, including the USTA, Pete Sampras, Tennis Magazine, Chris Evert, etc, etc. It wasn't officially announced, but the price was supposedly $100 million. A small deal, perhaps, when you consider Oracle just spent billions acquiring Sun MicroSystems. But the difference is Ellison bought Indian Wells personally. Then again his estimated personal fortune is $35 billion. Indian Wells, now owned 100% by one man. Fascinating you say, but why would someone with no previous formal association with pro tennis buy the world's fifth biggest tournament? 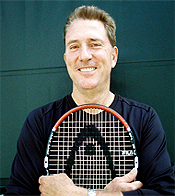 Well, it turns out Larry Ellison is a tennis nut. Like at the super fanatic level. I heard from an Indian Wells insider that during negotiations, the people on the tournament side were astounded by how much Ellison knew about tennis--players, matches, statistics, finances--everything. It was like he'd been an insider for decades. Now that was a surprise, because I've never seen or heard of him around any of the clubs in the Bay Area, and that's where Oracle is based and Ellison lives. So who does he play with? Well, it turns out, mostly a couple of famous former world class players, Sandy Mayer and Trey Waltke. 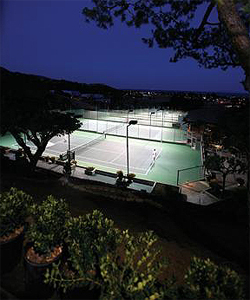 The Malibu Racquet Club, where Ellison plays with our own Trey Waltke. Sandy was a top 10 player in the 1980s and one of the greatest attacking players of that great attacking era. For years, I've been trying to talk him into writing some articles for Tennisplayer on the volley before it's too late and the shot reaches total extinction. Trey, as you may know, is a contributor to Tennisplayer, though that is not really his main claim to fame. (Click Here to read his awesome article on the backhand slice drive.) I've known Trey since he was an elite junior player from St. Louis. He used to come to Tulsa, where I grew up, and dominate one of the biggest tournaments in the Missouri Valley section. Sandy, who is also based in the Bay Area, sometimes plays with Larry several times a week. But Larry also spends time in Malibu and plays there with Trey. In fact Ellison bought the Malibu Racquet Club and, under Trey's guidance, completely remodeled it. It's a very cool spot. The club has a genuine Australian Open court, a real French Open red clay court, and you guessed it, the grass court is likely coming next. So is it possible that the influence of these two guys was responsible for the purchase? I'm guessing that Larry Ellison is the type of person who calls his own shots. But Sandy and Trey had to have facilitated Ellison's love for the game. 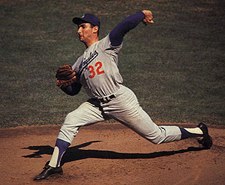 According to Larry Ellison rpms may have been the key to the Sandy Koufax curve ball. So what does all that mean for Indian Wells? The press release says that the current management team stays in place for 4 years. So in the short term, the transition will probably appear seamless. But one of the other interesting things I learned from Sandy and Trey is that Ellison sees the acquisition as a business decision, not a personal vanity move. So what does he have in mind to further grow or market the event? And what about all those extra acres around the site that were part of the deal? More great hotels? A high tech tennis academy? Who knows, maybe I'll be reporting on that in next year's article. Nadal's forehand averages more spin than any pro player. Which brings us to this year. One thing that won't change is the aesthetic of the event. The minimalist beauty of the desert and that extends to the site itself. All that open space framed by desert trees, plants, flowers. And then there are the courts. 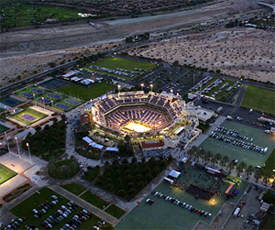 3 stadiums, plus the outer match courts. If you have a ticket to the main stadium you have access to everything. And a grounds pass will get you in everywhere but the big stadium. 5 years ago the outer match courts and the practice courts were ridiculously wide open, and even the two stadiums were basically always accessible. Everything is more populated now. But have you ever tried to watch matches on the outer courts at the U.S. Open? They probably sell twice as many grounds passes at the Open than they should, and a lot of people in tennis now feel it's barely worth it to go. You can't get a seat and if you do, you're stuck on that court for good. What does it feel like at Indian Wells? Click above. Not Indian Wells. You can move more or less freely on the outer courts, although occasionally they'll be totally full. If you want to see a match on the second stadium you can still get in there if you time it right, and the third stadium almost always has seats. I've said it for years, and I'm saying it again now. Indian Wells is the only place to go if want to get the feeling of world class tennis from close range. And have a great time in a great environment. Click on the “I Feel Indian Wells” music video from last year and you'll see what I mean. It may look silky, but up close it's frightening. And by feeling I also mean this. Roger Federer may look silky on television. But until you have watched from 10 feet away as one of those forehands explode off his racket like a deadly missile, you'll never understand the heart stopping power in the pro game. Close up, the sound is actually frightening. And you can have that exact, frightening (exhilarating?) experience for yourself watching Roger at the Indian Wells practice courts, because he comes there to show off almost everyday. And you can also have the experience with about 200 of the greatest players in the world everywhere else on the site. I call it the Osmosis Effect. (In fact I devoted a series of articles to it Click Here.) Since sports learning is really a matter of seeing and feeling, just hanging out at Indian Wells will cause your tennis to improve. You won't be able to help it because the sights, sounds and feelings of world class technique will percolate into your nervous system. Basically everyone in the main draws is worth watching when you can get this close, and in the early days you can get top 20 players on those outer courts. And for those males among us who harbor fantasies that they could hold their own with the top women---well, all I can say is, after seeing the ball speed in the women's game first hand, unless you are truly delusional, that fantasy is going to be hard to maintain. At close range, you can't stop osmosis learning. The other fantastic thing about the event is the whole desert resort environment. Our team has gotten quite found of the Hyatt Grand Champions Resort (Click Here). The Hyatt also has a shuttle bus back to forth to the event every 30 minutes. There is a great gym where the players work out, and personally, I like to head down to the spa pool and the hot tub around midnight. Of course the most beautiful tennis resort in the world is also in the area, LaQuinta. (Click Here.) The prices there during the event will test your belief in your socio-economic status, and there is no shuttle. But the top players like Federer and Nadal and Djokovic stay there and get in some of their practice at the gorgeous tennis complex. The fun thing is you can drive over there and watch them practice, and, if you aren't obnoxious, nobody at LaQuinta seems to mind. But hey, you know what, when it comes to hotels, the Holiday Inn Express will get the job done too, and it actually has one thing over LaQunita - the same regular shuttle service as the Hyatt. The Grand Hyatt and LaQuinta - gorgeous desert resort hotels. Which brings us to the other big news for 2010: Lansdorp and the Mojitos. And a few other Tennisplayer notables, including Allen Fox, Craig Cignarelli, Scott Murphy, myself and other pending guests. Every year the out door bar near the Tennis Warehouse pavilion has a theme drink, and this year is the year of the Mojito. So we'll have a little mojito get together on that first Saturday of the tournament, March 13, at the Mojito Bar, 5:30pm. If you are a subscriber, or a former subscriber, or not a subscriber, or just hear about it from a friend, come on down and seize the chance to meet us all before the evening matches. Le St. Germain: surprising French food in the world steak house capital. If you live in California and they grant you vacation at your job, you have absolutely no excuse not to come to Indian Wells. And if you don't live in California the same thing is probably true, because it's the best event in tennis, and you should come find that out for yourself. Just my opinion.